A baby monitor allows you to keep a check on the baby as you attend to other responsibilities and chores around the house. The monitor transmits recognizable sounds, like the baby cries, and in the case of a baby video monitor, even images and live feed. This gives you peace of mind as you attend to the chores, as you can keep track of what the baby is up to. The complete set is composed of two parts, the transmitter and the receiver. The transmitter is usually placed in the nursery, or wherever the baby is, while the attendant carries the receiver. 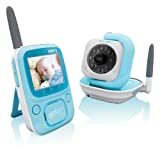 There are basically two types of video baby monitors; analogue and digital. Both operate using signals at set frequencies to transfer sound and image. The analog monitors send the signal directly, without encryption. They are far much cheaper and more common than the digital types. However, lack of encryption means that the signal can be picked up by other receivers including RF, radio and wireless gadgets. The digital monitors on the other hand first encrypt the data before sending to the receiver. This makes it nearly impossible for the recognizable sounds to be heard by anyone else except the intended receiver. However, the main challenge is getting a monitor that is free of buzzes, static interference and irritating noise. The main interference sources include nearby placed phones, radios and television. For the video baby monitor, the main interference includes blurry images and disturbing images from the neighbors. There are thousands of signals in the air, all at different frequencies. These include telephone signals, TV, radio and others. The signals are more pronounced for wireless equipment. The only way to beat the interference is to purchase a digital video baby monitor. The included digital enhanced cordless technology is integrated with technology that encrypts the data sent, such that it cannot be intercepted. They offer more privacy that the analogue types, which can get picked up by RF receivers and other gadgets that depend on signals to work. Most of the standard units operate at 49 megahertz. From 49, the next one operates at 900 megahertz. Though this operates at a higher range, it is more susceptible to interference from older generation phone that operated at this frequency. The latest versions are set at 2.4 gigahertz. This however will still face interference if there is a wifi gadget in the house, as they use the same frequency. To address this, the newer versions are at1.9 gigahertz for less interference and more security. Sometime the batteries might run out without your knowledge, leaving the baby to cry for hours. It is recommended that you purchase a unit that offers early low battery warning, either through a sound or a flashing light. Prior warning will allow you to purchase replacements early in advance. The basic types of video monitors only feature the transmitter and receiver. There are new versions that have a whole lot of extra beneficial features. This include multiple receivers, sound activated lights, temperature monitors and internet accessibility. This will of course add on to the price of the unit, but they come in handy. 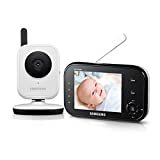 You can also read my article What Are The Best Video Baby Monitors?